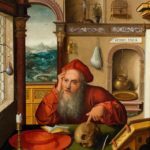 Jack “The Agnostic” Garcia examines the life, legend and prolific writings of the extremist yet very intellectual doctor of the church, St. Jerome. 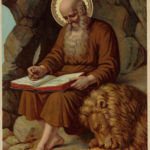 A man of immense learning , a biblical and classical scholar, fluent in several languages – St. Jerome’s translation into Latin of the Hebrew and Greek scriptures (The Vulgate Bible) would remain the standard Latin text for well over 1000 years. His enormous influence on Christianity was achieved partly in spite of himself. 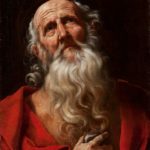 For St. Jerome was a harsh and constant critic of the clergy and the church , and his spectacularly irritable temper and sarcastic wit made him more enemies than friends. Jack also examines St. Jerome extremist views on sexuality, virginity, celibacy and marriage. Ideas derived from the third century theologian origin and the Gnostics unusually harsh views that would make the Puritans seem like swingers by comparison. Six tracks hit forward to advance.